Two views showing each side of the book. View of pages 2 and 3, digital inkjet printing on digital aya. Verso image is a single window and the recto image is constructed of eleven different window images layered and multiplied together. View of pages 18 and 19, digital inkjet printing on digital aya. Verso image is a single window and the recto image is constructed of two images layered and multiplied together. View of pages 8 and 9, digital inkjet printing on digital aya. Verso image is a single window and the recto image is constructed of five different transparent window images layered together. View of pages 12 and 13, digital inkjet printing on digital aya. Verso image is a single window and the recto image is constructed of seven transparent window images layered together. Hand sewn quarter bound codex in a dos à dos structure with a wrapper, digital inkjet printing, book block paper is digital aya, covers and wrapper are coated tyvek, Eterno board covers. My photogravure prints and book works explore variations of three ongoing preoccupations: instances of perceptual paradox, illusionism and illumination. 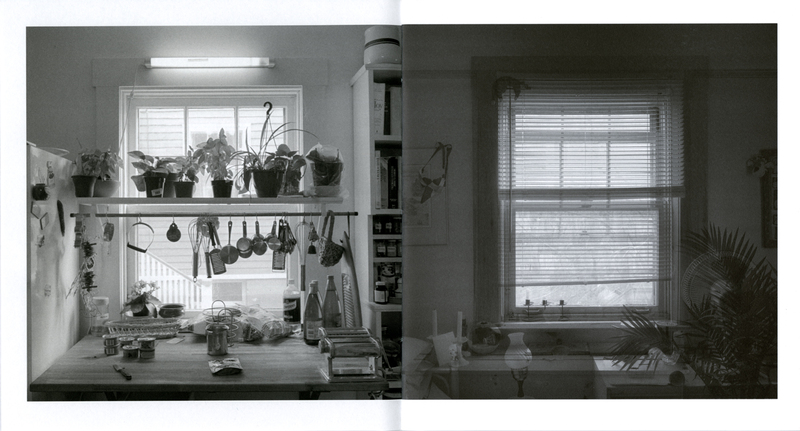 I use the camera to record within and about domestic architecture. From this imagery source I create prints that echo the sensory and temporal paradoxes we may experience during the perception of the quotidian. Illusionism underscores the uncanny response as we view an image that is persuasive in its spatial representation while maintaining the graphic material flatness of paper and ink. External light filters our perception of interior spaces and reiterates the architectural and perceptual threshold. My artist’s books emphasize visual narrative and the effect of image memory in constructing sequences. 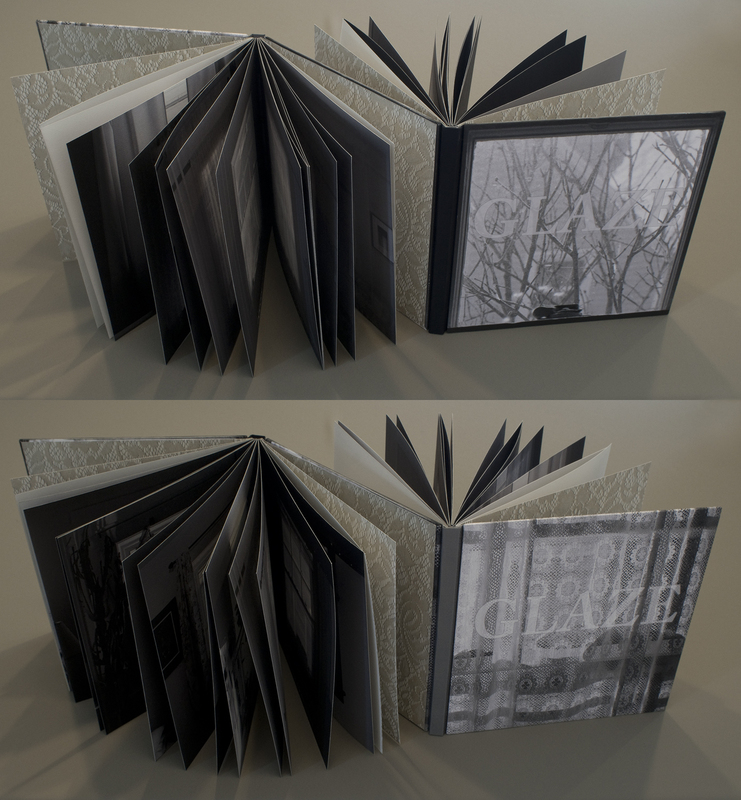 Glaze: Reveal and Veiled is one of a series of artist’s books inspired by the experience of living in Corner Brook’s Townsite area on the west coast of the island of Newfoundland. Between 1924-34 the pulp mill built 150 homes to house the mill management and skilled labourers. 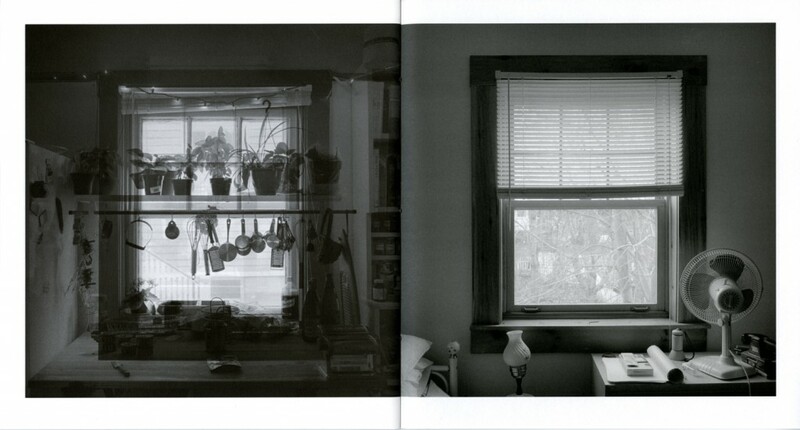 Over a period of 10 years, I have photographed in six homes, all the same model as the one I live in. These homes vary in condition from close to original in design and décor to highly renovated. This project gave me the rare opportunity to record the evolution of interior aspects of these homes. It has been the context to explore the paradoxical phenomena of conformity and individualization that occurs in a company town. Having grown up in a suburban housing development, my earliest memories of home is that of living in a space that is reminiscent of my neighbors’. Each artist’s book explores a distinct facet of image memory, multiplicity, sequence and offers the viewer a visual equivalence of the uncanny. Glaze: Reveal and Veiled presents 24 images of Townsite windows grouped into two distinct sequences. The structure is a dos à dos and each side offers a different visual metaphor for memory. The closed book is contained within a wrapper and the viewer has the option of choosing which side to enter first. Each begins similarly with endpapers made from scans of window curtains followed by line drawings of the window frames as the graphic for the title pages. Moving into Glaze: Reveal, the viewer is presented with a spread consisting of a blank white space on the verso and dense black on the recto. 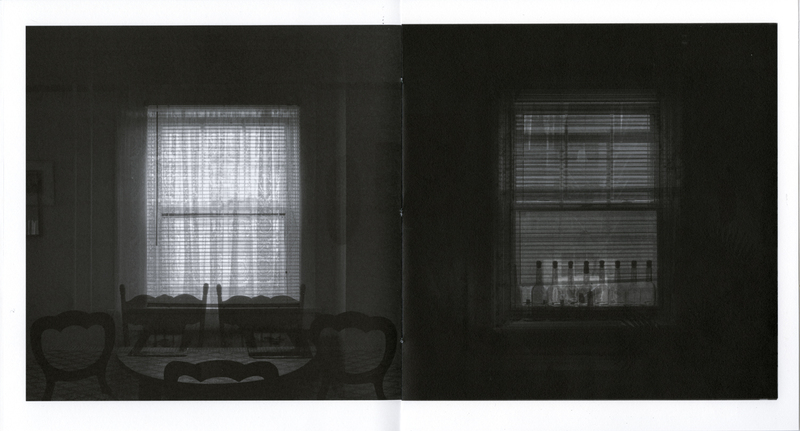 Turning the page, the next spread presents an image of a window on the verso and a dense black field on the recto with a glimmer of light appearing. As the viewer continues to move through the pages, each spread reveals a new window image that has been visually peeled away from the densely layered recto. The layering slowly becomes visible revealing the final presentation of single images. In contrast, moving into Glaze: Veiled the viewer begins with a window image that is layered with the previous title page line drawing. 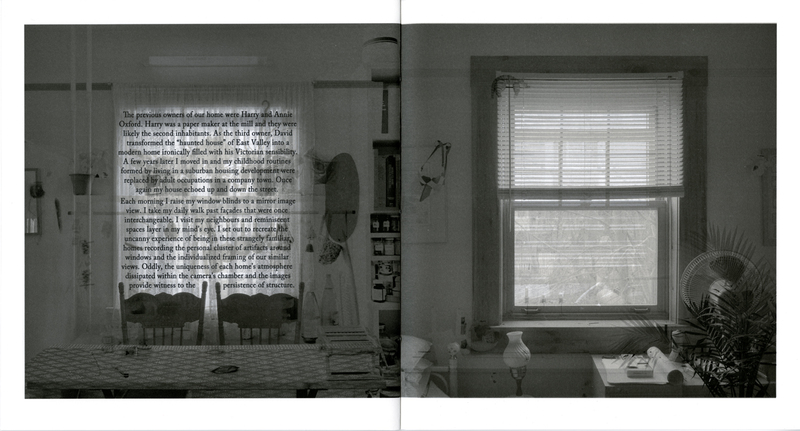 In the next spread, the same window is presented alone on the verso. The recto side layers the previous images as well as introducing the upcoming image. The viewer experiences a visual déjà vu each time the pages turn. The progress through the work results in ever more layered and veiled images.